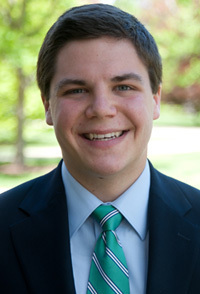 Michael J. O’Brien, a political science major from St. Charles, Ill., has been named valedictorian of the 2012 University of Notre Dame graduating class and will present the valedictory address during Commencement ceremonies May 20 (Sunday) at Notre Dame Stadium. O’Brien, who also will be awarded an International Business Certificate from Notre Dame’s Mendoza College of Business, earned a 4.0 grade point average. O’Brien is editor-in-chief of “Beyond Politics: Undergraduate Journal of Politics,” and serves as president of the Notre Dame College Democrats, leading one of the most active College Democrats chapters in the nation. O’Brien is a fellow in Notre Dame’s International Security Program and has joined national security scholars and experts in small-group discussions. Under the direction of Political Science Assistant Professor Sebastian Rosato, O’Brien developed an original theory on how the structure of unipolar (single great power) international systems influences the foreign policy behavior of the unipolar state. He also conducted research on religious freedom, regime composition and Islamic political movements in Muslim-majority countries. A finalist for both the Rhodes Scholarship and the Gates Cambridge Scholarship, O’Brien will co-author, with Rosato, an article this summer on the durability of U.S. primacy, to be published by the Nobel Institute in Norway and later by an American journal of international relations. This fall, O’Brien will enter the University of Chicago Law School, having earned a full tuition merit scholarship. The Commencement invocation will be offered by Ashley K. Logsdon, a double major in biological sciences and theology from Pickerington, Ohio, who will graduate with a 3.99 grade point average. 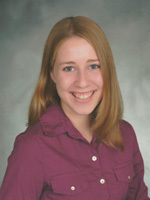 Originally published by Susan Guibert at newsinfo.nd.edu on April 27, 2012.